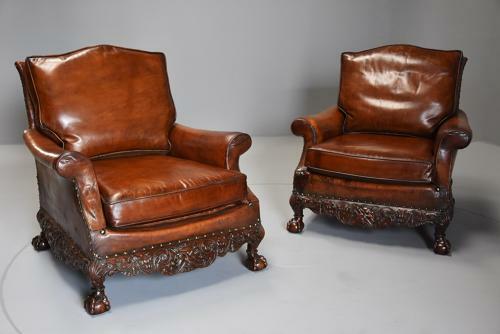 These chairs consist of original leather and mahogany frames with original upholstery apart from the seat and back cushions, these being newly made, upholstered and polished leather to match the original upholstery. The frames have brass stud decoration with mahogany bases consisting of superbly carved front rails with central 'Green man' decoration, foliate and tassel carving, the side rails with superbly carved scallop shell, foliate and tassel decoration. The legs are of cabriole design with carved scallop shell to the knee leading down to a ball bead collar terminating with finely carved ball and claw feet to both the front and back. This pair of chairs are extremely comfortable, are both in excellent condition for age, are of stable construction and can go straight into a home.